A special thank you to the many parents, students and staff members who reached out to us on Thursday evening to inform us of a threat made against our schools on social media. We take all threats very seriously, and worked closely with local law enforcement to thoroughly investigate the threat and respond appropriately. We're happy to report that this was found not to be a credible threat, and that students and staff across the district remain safe in our schools. It can be frustrating that the district, due to data privacy laws and active police investigations, is unable to share specifics about threats made or to give details on any disciplinary measures taken. We thank families for their patience and understanding, and we are grateful to our local law enforcement for their outstanding work to keep our students safe. What should a Stillwater graduate look like? We need the help of parents and community members in determining the skills, attributes and experiences kids need before they graduate. The Portrait of a Graduate will become an important document that will serve as the foundation of the district's next strategic plan. Help us design our future! Learn more. First-time kindergarten parents: Learn what to expect next year! Join us for a meeting about helping your child prepare for kindergarten. The event will take place Wednesday, Dec. 6 at 6 p.m. at the Early Childhood Family Center. Parent Educators will be sharing helpful information and will answer any questions you may have. A panel of parents will also talk about what was most helpful to them. RSVP online. Stillwater Area High School social studies teacher Sara Damon is sharing her travel adventures with students after visiting the Kingdom of Bahrain. Damon was one of just eight American educators chosen for the TEACH (Teachers Educating Across Cultures in Harmony) Fellowship. Read more about her trip. Two SAHS language arts teachers were honored at the National Scholastic Press Association Convention in Dallas. Laurie Hansen, who teaches language arts and yearbook, was the recipient of the Journalism Education Association Master Journalism Educator award. While Rachel Steil, who teaches language arts and newspaper, earned her Journalism Education Association Certified Journalism Educator certification. Students and staff at Stillwater Area High School are raving about our new Flex Time! It offers opportunities twice a week for kids to do homework, get academic help, or expand on personal interests like yoga and robotics. Read more about the program in the Pioneer Press. Oak-Land Middle School students are pledging to Choose Kind. Seventh graders watched the movie "Wonder" and then participated with classmates and staff in team building challenges where they learned about kindness, empathy and courage. Students at Stillwater Middle School got an insider look into the making of the Polaris Slingshot. James Holroyd, the the man behind the futuristic-looking three wheel motorcycle, talked to students about the process that went into designing the open-air roadster. He's the first in a series of speakers to participate in the school’s Science in Action initiative. Read more. Looking for a perfect, part-time job? Looking for a flexible, part-time job? 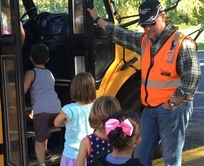 Become a school bus driver! Driving bus is a fun and rewarding job, with flexible schedules perfect for parents, retirees, and college students. No nights, no weekends, and no holidays! Starting pay $17-20.25 per hour depending on qualifications. Apply online at Minnesota Central. The school board will meet on Thursday, December 7 at 4:15 p.m. at Central Services (1) in closed session for preliminary consideration of allegations or charges against an individual(s) subject to the Board’s authority, pursuant to Minnesota Statutes, Section 13D.05, subd. 2(b); and (2) possible action authorizing post‐investigation measures. See official notice.